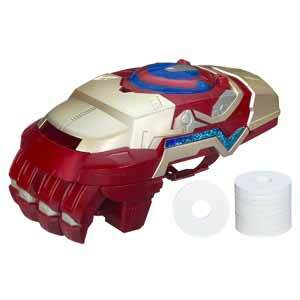 Hasbro's new line of toys to support the release of Iron Man 3 includes this interesting weapon toy that is designed to reproduce one of the movie's cool gadgets for young fans. The Nerf ARC FX Gauntlet comes with 10 foam discs which slot into the top of the gauntlet. Then, when it's switched on the discs can be fired (up to a range of 6 metres). The toy is made of strong plastic and will help young fans to recreate scenes from the movie. The motor which runs in order to fire the discs is quite noisy, but almost sounds like it's designed that way. An added bonus is that your little ones won't be able to sneak up on you without your hearing them. It requires 3 x AA batteries (which are not included). 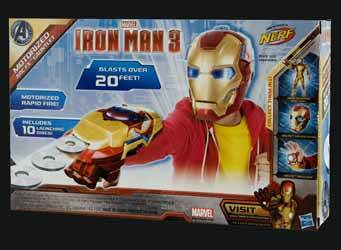 It's a fun and well constructed toy, which will appeal to old and young Iron Man fans.